‘RJ’ stands for ‘Rong Jian’, which is his Chinese name. 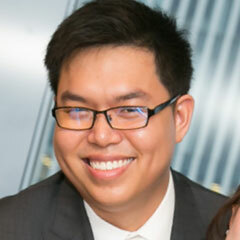 RJ married Saori in 2017 after a five year, long-distance relationship, and commenced his ministry apprenticeship in 2018. Moving from Singapore at the age of 14 to study in England had a profound impact on RJ. He was an atheist for most of his life and (for a short period) an idolater. When God answered one of RJ’s prayers, he promised to be a follower even though he didn’t understand much. Soon afterwards he learned about the salvation that comes through faith in Jesus Christ, and he trusted Christ as Lord and Saviour. RJ relaxes by reading, playing board games, walking in natural environments (ask him about Tasmanian beach crabs), and watching movies (Porco Rosso is a favourite). He likes chocolate cake and durian smoothies! RJ oversees Trinity Internationals Bible Study (TIBS) and leads the Easy English group. Meeting up with and caring for international students is a big part of his role. His focus is on helping believers to mature in their faith and to support other TIBS leaders.